I was born and grew up in Vietnam, the place where always brings me a feeling of peace, a happy life, but is not any less interesting. That is the reason why I love my country, and I always hope to show tourists the best view as well as the best ways to discover Saigon (Ho Chi Minh city ) when they come to Vietnam. Luckily I had chances to work at some tourist companies when I was a student. From that I understand the feelings and desires of visitors when they come to Vietnam. And it seems to me that the normal tours did not meet their needs which are constantly looking for the most interesting and unique things at the country they are traveling. Knowing their desires with the local knowledge of mine, after graduated, I decided to establish a new kind of tour that you can find only in Vietnam, the country has the highest density of traffic in the world, that is traveling by bike. This service will help tourists have an overview of Vietnam, as well as have a deep and unique feeling about the country, culture, social and people that no any other services can. This was the best tour I have ever experienced. My Mom and I did this together and it is something we will never forget! Our guides were sweet, knowledgeable and most friendly girls. Saying goodbye to them brought tears our my eyes!!! They took us to the coolest places and we tried all kinds of local food. I wish we could have hired them for our entire trip of Vietnam! If you do nothing else in Ho Chi Minh City DO THIS!!!! I will never forget it. Nor will my Mom! Such great fun; we booked the Night Tour for the evening of our first day in Vietnam and were glad we did; it was a great introduction to Saigon. We had 3 bikes between 4 (including 2 children); the girls, Di, Tram and Ngan were charming and took a great pride in showing us their city. 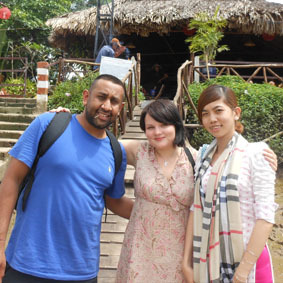 They spoke very good English and were happy to answer all the questions we put to them. Saigon traffic is chaotic to say the least but we felt perfectly safe with them. Thoroughly recommended and good value. Booking online in advance was easy and faultless. We went for both the VietFood and Sights tour, and can honestly say was a very memorable experience. 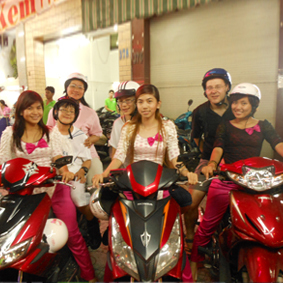 Ngan and the group are friendly, chatty and very safe on the motorbike. The food tour lasted over 4 hours and ended up tasting all sorts of food (& got totally soaked in the heavy Saigon rain - but this added to the experience). The next day we were picked up for the Sights tour, and the girls took us to some really nice places off the beaten track, and spent extra time driving us around the various Districts in Saigon. We would definitely book with them when in Saigon again. We had excellent experience our hosts were extremely friendly and helpful. Despite we had some fear about the traffic, immediately we get in use as the girls drives very well and make you feel comfortable. The food was really good, we went to different places and I can't said which was my favorite as all of them were delicious. The girls were just excellent, I will highly recommend this trip to my friends.